The European Organization for Nuclear Research said Friday it may announce next month whether tests with its atom-smasher have found the elusive "God particle", AFP reports. Known formally as the Higgs boson, the particle is the theoretical missing link in the standard model of physics and is believed to be what gives objects mass, though scientists have never been able to pin it down. 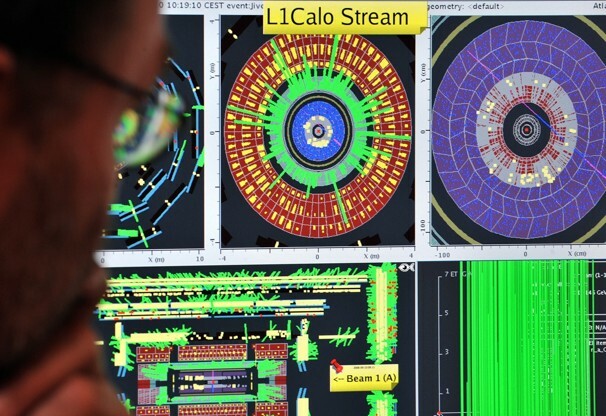 The organization, known as CERN, said that at a July 4 Geneva conference it will "deliver the latest update in the search for the Higgs boson" it is carrying out with its atom-smasher, the Large Hadron Collider. The theory behind the so-called God particle is that mass does not derive from particles themselves but instead comes from a boson that interacts strongly with some particles but less, if at all, with others. "In December we said that there were hints in the data that there may be something there (but) not strong enough to say it's a discovery or not," CERN spokesman James Gillies told AFP by telephone. "On July 4 we will be able to say whether either there is nothing in the data this year; or there are still hints in the data, but not strong enough for us to be able to say that it is a discovery; and possibly a discovery," he said. "Either of those three things is possible." The seminar will precede a major physics conference in Melbourne, Australia, where progress in the search for the Higgs boson will be reported. The Large Hadron Collider, sometimes called the world's largest machine, is located in a 27-kilometre (17-mile) ring-shaped tunnel near Geneva that straddles the Franco-Swiss border up to 175 metres (580 feet) below ground. It fires streams of protons in opposite, but parallel, directions in the tunnel. The beams are then bent by powerful magnets so that some of the protons collide in four giant labs, which are lined with detectors to record the sub-atomic debris that results. Working from Higgs' theory, scientists postulate that initially weightless particles move through a ubiquitous quantum field, known as a Higgs field, like a pearl necklace through a jar of honey. Some particles, such as photons — weightless carriers of light — can cut through the sticky Higgs field without picking up mass. Others get bogged down and become heavy; that is the process that creates tangible matter. "The Higgs gives everything in the universe its mass," says David Francis, a physicist on the ATLAS experiment. How it started: "A file photo taken on September 10, 2008 shows a European Organization for Nuclear Research (CERN) scientist looking at computer screens showing traces on the Atlas experiment of the first protons injected in the Large Hadron Collider (LHC) during its switch-on operation at the CERN's press center near Geneva." Image Source: Fabrice Coffrini - AFP/Getty Images via Washington Post. In addition, establishing the existence of the Higgs Boson particle, dubbed 'a ghost in the machine' by Time Magazine, is one path to establishing a Theory of Everything. Hyperphysics states that the concept behind the Theory of Everything is that there are four main fundamental forces in nature: "the strong, electromagnetic, weak, and gravitational forces. But why four? Why not just one master force?" This idea is popularly associated with 'the Force' depicted in the Star Wars film sagas. George Lucas actually imagined the Force as a metaphysical life force. Is a link to the Theory of Everything a cringe-worthy metaphor? Perhaps, but that pop cultural reference makes a complex problem intuitively and commonly comprehensible. May the Force Be With You. Image Source: Gizmodo. [The] Theory of Everything [TOE] would unify all the fundamental interactions of nature: gravitation, strong interaction, weak interaction, and electromagnetism. Because the weak interaction can transform elementary particles from one kind into another, the TOE should also yield a deep understanding of the various different kinds of possible particles. The usual assumed path of theories is given in the following graph, where each unification step leads one level up. One early example established an interaction between electricty and magnetism to explain electromagnetism; natural examples of electromagnetic visible radiation invited legendary metaphors, and were commonly known as St. Elmo's Fire, Foo fighters, or even Will-o'-the-Wisps. A timeline of theories about the electromagnetic interaction, running back thousands of years, is here. Wiki: "Electromagnetic force is one of the four fundamental interactions in nature, the other three being the strong interaction, the weak interaction and gravitation." Grand Unified Theories explore the union of electromagnetic and strong and weak forces. A Grand Unification Theory would confirm the next step up, an electronuclear force. Discovery of the Higgs Boson would substantiate the unification of the electromagnetic and weak forces, known as the electroweak interaction, subject of the 1979 Nobel Prize in Physics. See the significance of the Higgs Boson to the electroweak interaction discussed here, described metaphorically in terms of the 1980 arcade game Pac-Man. In the meantime, Internet rumour has it that the Higgs Boson particle has indeed been discovered. Some physicists take the Higgs Boson as read and are already moving Beyond the Standard Model to find Supersymmetry, the notion that every particle has a partner particle. The idea solves a mass problem associated with the Higgs Boson. Supersymmetry unites the weak and strong interactions with electromagnetism under certain conditions. Supersymmetry additionally helps to explain Dark Matter. How curious that dualism and Doppelgangers just happen to be well known Millennial metaphors, and provide critical symbolic material for the 2012 phenomenon, with its gnostic twin universes, shadow suns and hidden twin planets. No matter how misguided or inaccurate these symbolic parallels of serious research are, they facilitate public understanding of physics. "The greatest trick the Higgs ever pulled was convincing the world he didn't exist"
"They say that if you stand in front of a mirror and scream "Higgs Boson!" three times, Feynman rises from the dead...TO FEED"
"God doesn't like people messing with his particle. Prepare to die." "The mass of the Higgs is what Bill Murray whispers to Scarlett Johansson in the final scene of 'Lost in Translation'"
"Announcement of Higgs boson discovery travelled back in time to start #HiggsRumors trend. True story." "Some communities in the troubled Euro-zone have begun to use bosons as currency." "I have eaten the Higgs Bosons that were in the icebox and which you were probably saving for electroweak unification..."
"The Higgs has been hiding out in Pakistan the U.S say they have captured killed & dumped the higgs in an undisclosed location." "The Council of Troyes originally sanctioned the Knights Templar in order to protect the secrets of the Higgs boson." "ATLAS and CMS both beaten to Higgs detection by Chuck Norris." "On the Summer Solstice, you can balance a Higgs Boson on end." 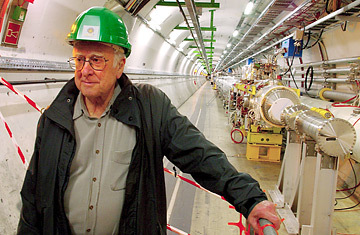 "Physicists invented the Higgs boson to steal funding from chemists & biologists." "During the 'Luke, I'm your father' Star Wars scene, Higgs stood in as Vader's voice. Lucas thought it would 'add more gravity.'" 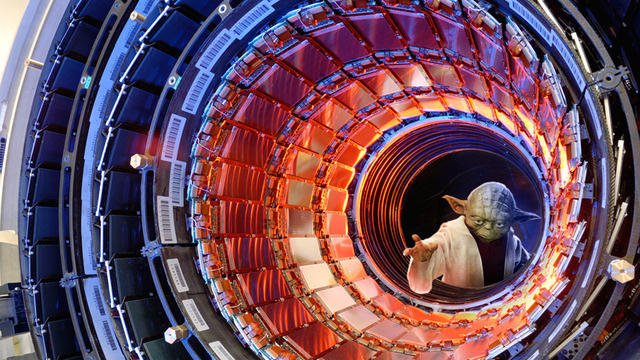 "The Higgs Boson is coming from INSIDE THE HOUSE! =80"
"The God Particle actually is an atheist"
"Scientists found the Higgs boson decades ago...when it crashed in Roswell"
"Turns out the Higgs really was in the Pulp Fiction suitcase"
"Why the excitement? J.J. Abrams discovered and cast the Higgs as the villainous planet destroyer 'Red Matter' years ago." "The pseudogonopod Higgselstop Bosonai is known for its reticulated slime pattern." "My mother? Let me tell you about my mother.< Higgs raises pistol and fires into terrified, seated boson.>"
"new discovery: Higgs is God, God is a particle, will he explain gravity?" 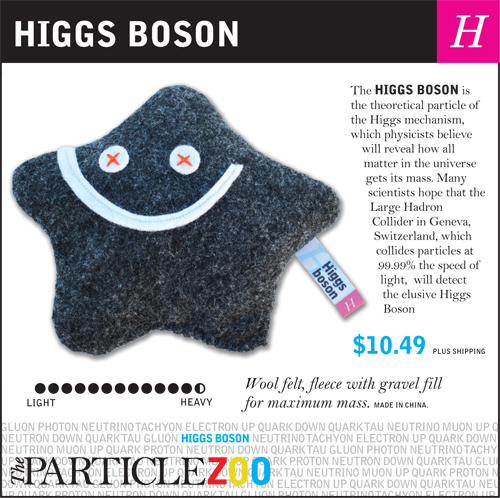 "The Mayans not only predicted the Higgs Boson, they predicted that when it was found, the world would end that same year"
Finally, Particle Zoo, a vendor that sells subatomic particle plush toys, is capitalizing on the rumours with the Higgs Boson stuffed toy. You can also get the Boson 5-Pack for $50.99.